Is it possible to display file preview? Activating the main menu item “View → Quick view panel” or the shortcut “Ctrl+Q” switches the quick view panel on/off. In the quick view panel the item highlighted in the active panel is shown separately. The quick view panel stays open (even, if other items are highlighted in the active panel) as long as it is not closed by activating the main menu item “View → Quick view panel” or the shortcut “Ctrl+Q”. How to view all files and/or (sub)folders within the current folder? Activating the main menu item “View → Plain view – files” or the shortcut “Ctrl+B” activates the plain view for the active panel, or deactivates it. If “Plain view – files” is activated, only files (and no folders) are shown. The files of the main folder and of all sub folders are shown in one list, independent of their paths. To view folders only, use the main menu item “View → Plain view – folders” or the shortcut “Shift+Ctrl+B”. If you want to view all items – files and folders, use the main menu item “View → Plain view – files, folders” or the shortcut “Ctrl+Alt+B”. While any plain view mode is active, the background color of the panel is highlighting. This can be defined in the tab “Color/font” of the main menu item “Tools → Settings → View → File/folder list”. Attention: the display of the plain view could be slower than expected. It can be canceled with “ESC” key. How to display the size of folders in Details view? Activating the main menu item “Folder → Size of folders” or the shortcut “Alt+F9” activates/deactivates the determination and display of the sizes of the folders in the active panel. How to display the size of selected folders only? Use the keyboard shortcut “Ctrl+F9”. How to display the size of the current folder quickly? 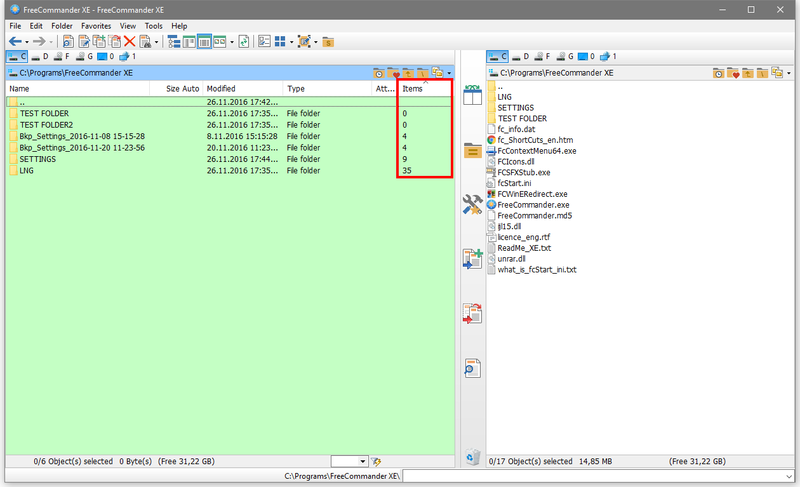 The “Space” key determine and show the size of the current folder. Note: You can find the size of the current folder also in the status bar, it’s useful if you are using other views (e.g. : List, Thumbnails). How to find empty folders? 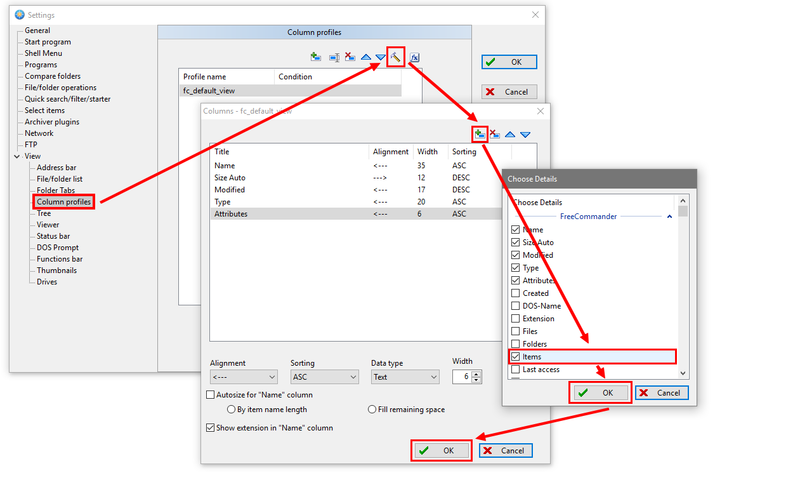 To identify empty folders, go to Settings (F12) → View → Column profiles, create new profile, or edit existing one, and add the column “Items” to the profile, then restart FreeCommander. You may need to change the file list panel width, or/and other columns width to see the “Items” column. You can drag the “Items” column left, if you want. Then click the “Items” column label, to view all emply folders on top. If you want to find empty folders from all subfolders, or/and from different locations, you can use Plain view – folders (Shift+Ctrl+B), or File container, or even Search (Ctrl+F) and export the results to File container. Note: 0 Byte(s) in the “Size” column doesn’t mean the folder is empty, it may contain folder(s) and/or file(s) with size 0 Bytes. When using the “Items” column, you don’t need to activate the “Size of folders” option and wait for calculating the folder size which may be slow. How to redirect Win+E to FreeCommander? In Windows the shortcut “Win+E” (with “Win” being the Windows key How to redirect Win+E to FreeCommander.png) opens the Windows-Explorer. 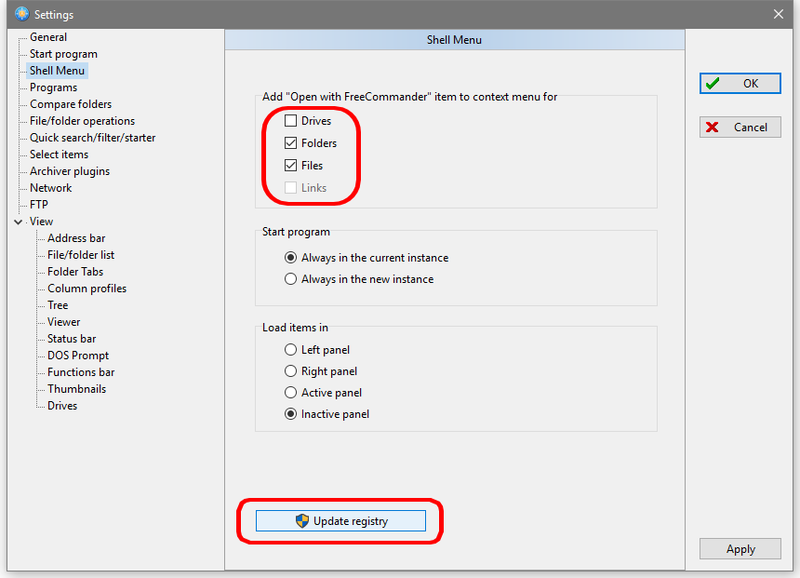 Activation of the FreeCommander menu item “Tools → Redirect “Win+E” to FreeCommander” redirects this shortcut, it opens the Windows-Explorer no longer, but opens FreeCommander. After activation of the menu item “Tools → Redirect “Win+E” to FreeCommander” this menu item is preceded by the icon How to redirect Win+E to FreeCommander2.png. After activating this menu item again the icon is no longer shown and “Win+E” opens the Windows-Explorer again. This redirection requires the availability of the file “FCWinERedirect.exe” in the FreeCommander install folder. How to open items from Windows Explorer with Free Commander? 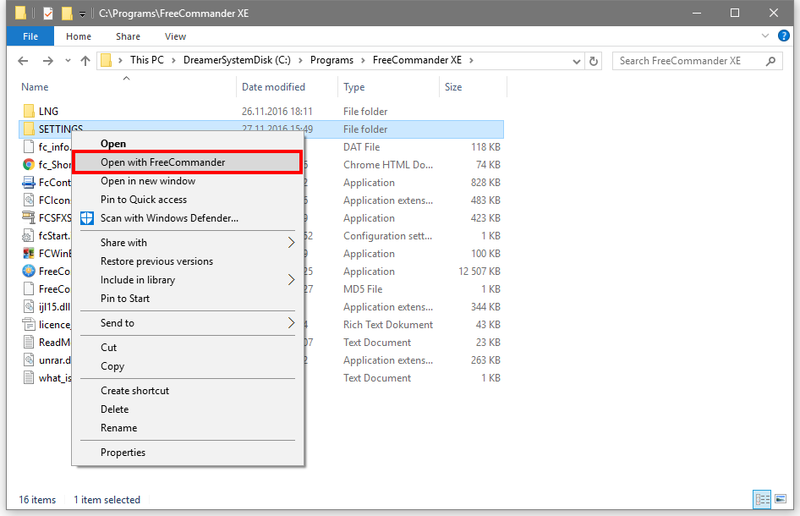 In FreeCommander open the Settings (F12), go to Shell Menu and check the items you want to open with FreeCommander (Drives, Folders, Files, Links). You can select also if you want to open items in the current or new instance, and in which panel you want to open items. Then Click the “Update registry” button (User Account Control dialog may appear, you need to click “Yes” to activate the option). 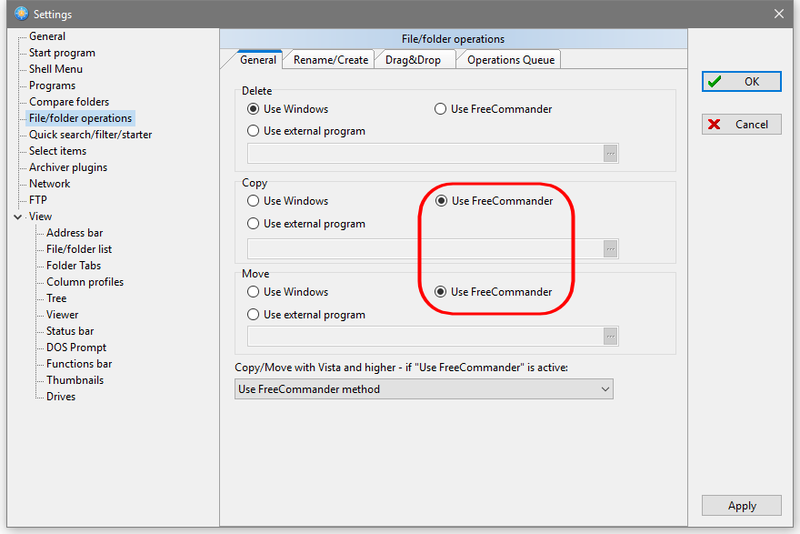 From now on, you can right click the item in Windows Explorer and choose “Open with FreeCommander” to open this item in FreeCommander. FreeCommander is not responding when copying or moving the file(s), how to avoid it? Do not perform too many operations at once. Alternativly you can try the FreeCommander file operations and the Queue feature, this way only one operation is performed at the time, you can add the new operation(s) anytime, they will be added to the queue and performed in background, so you can use the FreeCommander during the operations. The Queue feature is available only if the FreeCommander file operations are enabled, to do this, open the “Settings → File/folder operations → General” and set “Use FreeCommander” option for Copy and Move. 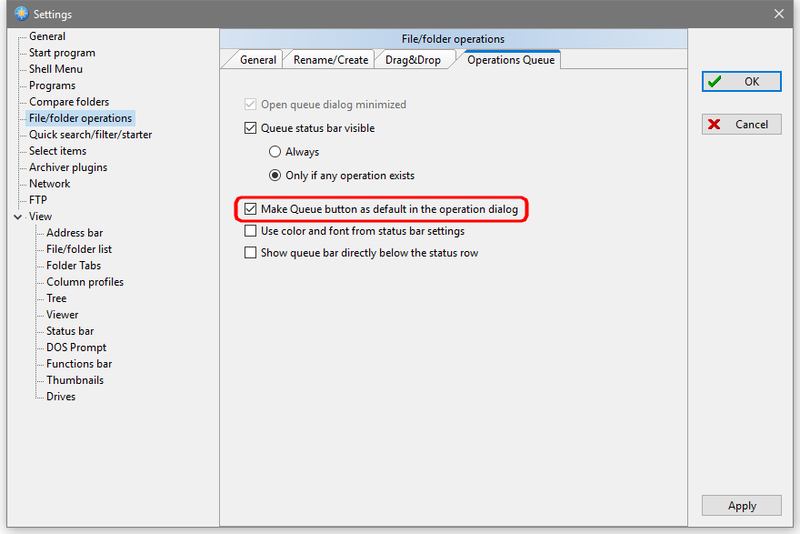 You can also use the option “Make Queue button as default in the operation dialog” in “Settings → File/folder operations → Operations Queue”. Note: FreeCommander file operations work only when using splitter bar Copy/Move buttons or F5/F6 hotkeys, they don’t work when using drag&drop, or Ctrl+C / Ctrl+X / Ctrl+V keyboard shortcuts. I have connected my smartphone / tablet via USB, but it’s not shown between the drives, where can I find it? Select Desktop from the drive bar (Shift+0) and then select Computer / This PC. Here you can find your smartphone / tablet. I have connected my smartphone / tablet via USB, but I can’t copy/move the items, how to do it? Dependent on the FreeCommander and smartphone / tablet OS version, not all operations may work. Selection of items as in Norton Commander. The selection can be made with the “Space” key or the “Ins” key. What does “Theme off” setting do? If this setting is checked, the active Windows theme will not be used for FreeCommander’s user interface. A change of this setting will take effect only after restarting FreeCommander. Colors can be defined only if the setting “Theme off (need program restart)” is checked. However, if using NC-Mode, you can define the colors, even if “Theme off” setting is not checked. How to set the focus to item name only, and not to full row? Go to Settings (F12) → Select items → and uncheck the option “Full row select”. This option affects Details view only, it has no effect for List view and Small icons view. If you want to set the focus just within the item name, you need to check the option “Theme off (need program restart)”. This option affects Details view, List view, and Small icons view. How to display only one panel, as in Windows Explorer? Activating the menu item “View → Dual/one panel” or the “F10” key switch between two panels and one panel (as in Windows Explorer).